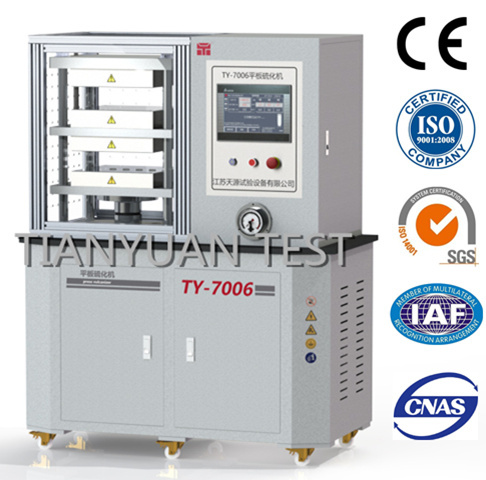 This rubber vulcanizing machine is used for making rubber vulcanization specimen. Our lab rubber vulcanizing machine generally uses the pillar type and frame type structure, compact structure, beautiful modelling, and mold force is great. The upper mould heat and press the raw material to make it shaped. The lower mould cools the shaped specimen with water. All operations and dynamic monitoring are achieved through the touch screen. Looking for ideal Rubber Vulcanizing Oven Manufacturer & supplier ? We have a wide selection at great prices to help you get creative. All the Rubber Flat Panel Vulcanizer are quality guaranteed. We are China Origin Factory of Rubber Vulcanizing Press Machine. If you have any question, please feel free to contact us.